In 1995, Conrad Schmitt Studios was commissioned by the Delta United Methodist Church in Delta, Colorado to re-create the church’s twenty-six 1910 windows, after the church was destroyed by fire. When Bernard Gruenke, Jr., President of Conrad Schmitt Studios went to investigate the remains of the church, he discovered that the shattered stained glass had already been meticulously cleaned up, and with it the best clues to the original windows. But, upon further investigation, he found that some glass had fallen into a parapet. From these–Jesus’ ear, eye, nose and part of his moustache, as well as some background glass, the Studio would be able to deduce the type of glass and painting in the original windows. The reproduction of the overall design was based on photographs–and another lucky break. On a hunch, Bernard Gruenke had gone looking for other churches in the same city that were built near the same time. 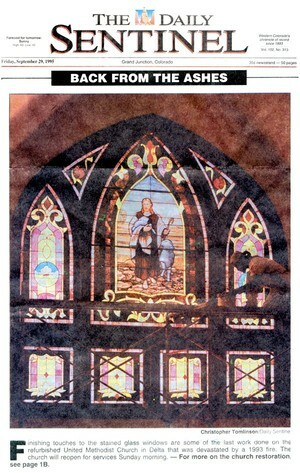 He found one whose stained glass and window designs were nearly the same as those from Delta United Methodist Church. The Studio’s subsequent search for the stained glass studio of origin led to the discovery that the original glass manufacturer was still in existence and still had the formula for the 1910 glass in its files; therefore, the specific glass was able to be reproduced. The extensive experience of the CSS Stained Glass Studio directors with historic glass and glass painting also enabled them to match the original style of painting and lead caming. When the windows were reinstalled, along with new storm glass, the congregation was gratified with the Conrad Schmitt Studios’ faithful reproduction of this essential part of their worship environment.